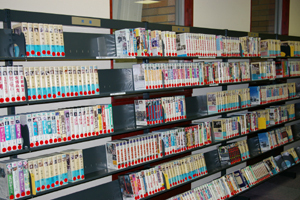 Video tapes, DVD discs, compact discs (CD) and cassette tapes can be checked out at the Video Library. The facility is located on the １st floor. You will need a regular library card to check out these materials.If you do not have a regular library card, please apply for one at the Check Out and Return Counter on the first floor of the library. In addition to checking out any library material, you will be able to check out up to 1 video tape or DVD disc and up to 2 compact discs or cassette tapes for a period of two weeks. 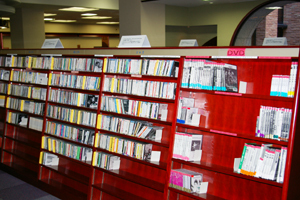 Please check out all visual and audio discs and tapes at the Video Library Counter. You may not check out new library material for a prescribed period if checked out material is returned late so please make sure to return all checked out material on time. It is possible to return material checked out at the Video Library at branch libraries. However it will take about one business day or more before the Video Library can receive returned material from branch libraries. 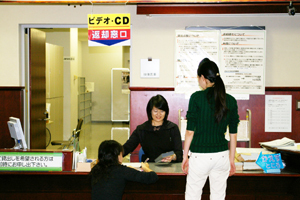 For this reason if the due date is approaching, we recommend that you return video library material directly to the Video Library at the Fukuoka City Public Library.